Countersunk A2 Stainless Steel Barrel Nut (with 6-Lobe Pin Drive). Ensures maximum security when clamping two materials together. 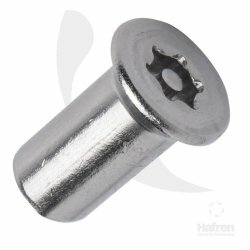 These Barrel Nuts (also known as Interscrews) are internally threaded parts that are ideal for clamping two pieces of material together when used with machine screws. Ideal for playground equipment, ironmongery and signage to name a few.